In the time I spent working on the referendum campaign with Vote Leave in Wales, from when I was a voluntary activist to taking on a full-time role, I came to this conclusion; the ‘Stronger In’ campaign was our greatest asset. Their activists (mostly Labour Party campaigners from what I could work out) were openly rude, arrogant and insulting. Not just to us however, but also to members of the public as we saw in my home county where the local Stronger In team managed to gain notoriety for their rude behaviour and distasteful attitude towards the public. 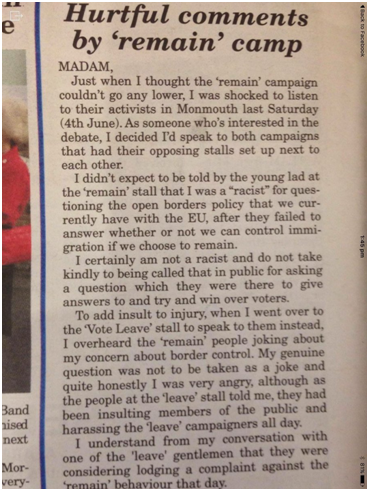 We would often run stalls in the towns to give out literature and meet members of the public, which sometimes meant clashing with the Remain campaign, as happened in Monmouth one Saturday afternoon. The Stronger In activists seemed to be getting a negative response from the public all day which eventually led to heated tension between their campaigners and difficult passers-by, of which one incident was highlighted in the local paper (pictured). This kind of condescending and almost snobby way of treating voters didn’t go unnoticed and in some parts of Wales has been rife for years through the political class (the biggest culprit being the Labour Party, who in Wales seem to take much of the South for granted). This idea cemented itself to me after meeting people on the high-street in Port Talbot during an action day we had organised. Every single person I spoke to took us as an opportunity to let some steam off and vent their anger at the EU, the political class and in particular their own MP who most of them said they had actually voted for (despite none of them holding him in high regard). Stephen Kinnock, the local MP for the good people of Port Talbot, was an adamant ‘Remainer’. But why wouldn’t he be? His wife is the former Prime Minister of Denmark, his mum is a Baroness and his father was once on the Commission of the European Union. This kind of lifestyle and family dynasty doesn’t reflect how anyone else in Aberavon and Port Talbot lives. Voters here could see straight through Stephen Kinnock and his support for remaining in the EU and so when polling day came, his constituents voted en masse to leave. My own party, the Welsh Conservatives, also pushed alienated and disenfranchised voters towards supporting the Welsh Vote Leave campaign through their support for Stronger In. When MP’s or ‘Assembly Members’ in our case supported the Wales Stronger In campaign publicly, it just gave the impression that they were wet and career-driven tools of Cameron. Only 2 MP’s out of 40 in the whole of Wales actually put any real effort into the Leave campaign; David Jones in Clwyd West and David T.C. Davies in Monmouth (both Conservative). Again, out of 60 Welsh Assembly members, only a handful supported us with most taking what they thought was the safe option of Remain. The Welsh Conservatives who did support Stronger In just helped us however, by linking the idea of a Remain vote with that of the boring Welsh Conservative grouping in the Senedd. 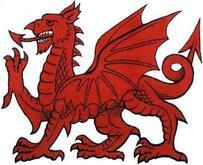 This link between the Wales Stronger In campaign and the Welsh political class, coupled with activists who seemingly did everything in their power to alienate potential voters led us to a comfy win on June 23rd. We had the support of the public in 17 out of 22 local authorities, particularly in the areas where Labour has taken for granted for so long. In Newport, staff at one polling station told one of our co-ordinators that they’d seen plenty of people coming in to vote who hadn’t been to vote in years and more who had never voted before to their knowledge. The Welsh public proved that although they’re sick of the same old politics here; that they will come out to vote if they’re prompted by mockery from the political class.